Transatlantic M&A continues to be strong as North American acquirers, both corporate and private equity (PE), spent $170 billion on European targets in 2015. Europe is expected to remain the target region of choice for North American acquirers in 2016 as the EU economy stabilises and concerns over China and emerging markets deepen. Targets in the UK and DACH region account for the majority of transatlantic M&A, followed by France, Benelux and Scandinavia. 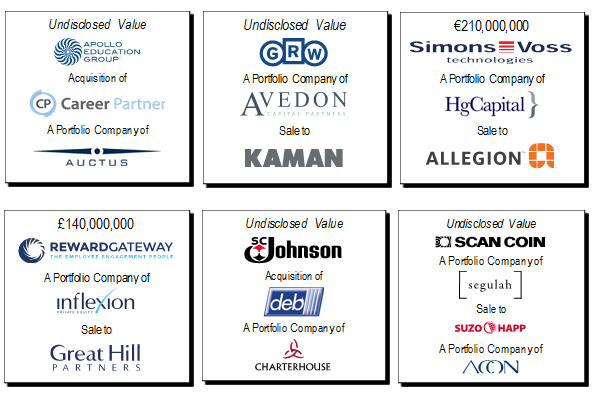 Middle-market deal opportunities are typically sourced from European private equity firms exiting their portfolio companies as well as carve-outs by European corporates and sales by founder owned businesses. High quality companies in Europe can attract significant interest from North American buyers across all sectors, from industrial to consumer. In the DACH region, Mittelstand companies tend to have innovative technology or intellectual property and hold leading worldwide positions within their niche markets. Their export focused sales and distribution networks provide access to new markets, geographies and customers in Europe as well as emerging markets. Online or SaaS (software as a service) business models are accelerating the globalisation of services. Scalable technology platforms in Europe can be rapidly internationalised by a North American corporate buyer through digital marketing and the cross-selling of services. Healthcare / pharmaceutical targets across the supply chain can be particularly attractive to US acquirers that want access to large public healthcare customers in Europe like the UK’s National Health Service. Pan-European companies have the expertise to manage operations in multiple countries, each with their own language, regulatory and financial frameworks. North American companies often prefer M&A to the Greenfield route in Europe, entering the continent through an already established European brand. Cross-border M&A requires the ability to manage diversity, including differences in language and corporate culture. Less experienced US acquirers often target assets in the UK first due to similarities in language and culture. North American buyers can increase their chances of a successful transaction in Europe by building relationships at the senior level with the seller, seller’s advisor and / or target at an early stage. A good understanding of market standard SPA (sale and purchase agreement) terms across the different countries in Europe can help a North American buyer deliver a compelling combination of price, terms and certainty. Common preferences of private equity sellers in Europe include the use of a locked box mechanism to determine the final purchase price before the signing of the transaction and W&I (warranty & indemnity) insurance to limit their financial exposure after closing the transaction. US M&A activity accounted for over half of the record $4 trillion of global deal value in 2015. Baird expects middle-market activity to continue in 2016, particularly for transatlantic transactions. North American firms, whether corporate or private equity, can combine a European target with their North American platform to create a leading global player. To learn more about Baird's Global Investment Banking capabilities and transactions, please visit rwbaird.com/investment-banking or bairdeurope.com. Robert W. Baird Limited is authorised and regulated by the Financial Conduct Authority.